Easter Sunday, April 21 2019, 7:00 pm. The Harvey Diamond Trio featuring Harvey Diamond, piano;Jon Dreyer, bass; Bob Gullotti, drums. At the New School of Music, 25 Lowell St, Cambridge MA. Walk from Harvard Square, take the #71 or #73 bus, or park free in the lot behind the school. Tickets https://www.brownpapertickets.com/event/4221859 or at the door. 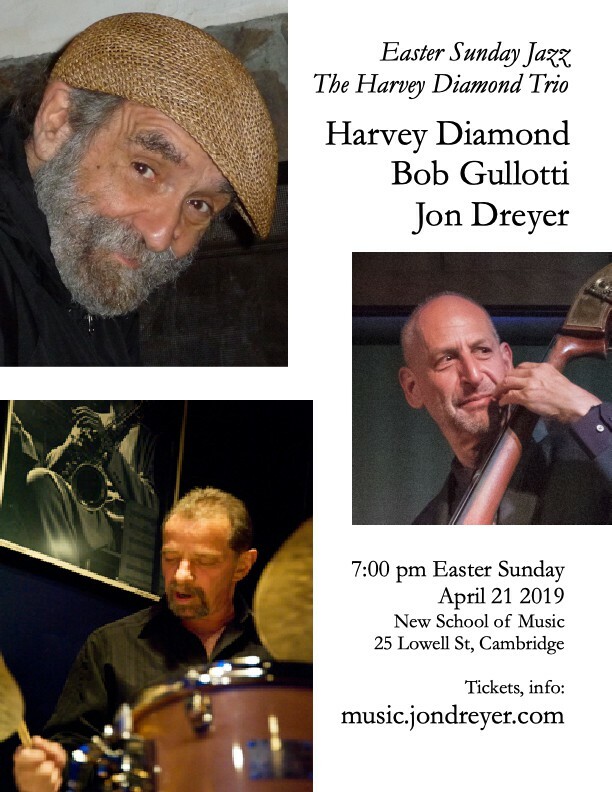 The legendary jazz pianist Harvey Diamond has graced the Boston area for decades with his music which is at once both deeply intricate and deeply emotional to even the most casual listener. Over the years he has performed across the U.S. and in Europe. A student of Lennie Tristano, he has done concert appearances with NEA Jazz Masters Sheila Jordan, Dave Liebman, and Art Farmer, and also with Charles Neville, Herb Pomeroy, Harvie S, Jay Clayton, Joe Hunt, Don Alias, Jason Palmer, Cameron Brown, Marc Johnson, Marcus McLaurine, and many others. He has released his second CD as a leader, Fair Weather , with Cameron Brown. This follows is first CD, The Harvey Diamond Trio . Cameron Brown says of Harvey, Harvey Diamond is a unique and brilliant musician: a pianist's pianist with a remarkable touch, unimpeachable technique and enormous dynamic range. A creative and unpredictable improvisor, Harvey's roots go back to Lennie Tristano and Bill Evans, spiced with just a touch of Cecil Taylor. He draws the audience into his world and holds it spellbound. Bassist Jon Dreyer is one of Harvey Diamond's closest collaborators. He also performs regularly with James Merenda, both as a member of his high-energy, jazz-ish band TickleJuice and also in more mainstream jazz settings. He has performed with NEA jazz master Sheila Jordan as well as most of the Boston jazz community, including Jerry Bergonzi, George Garzone, Jason Palmer, Phil Grenadier, Adam Janjigian, Yoko Miwa, Frank Wilkins, Dominique Eade, Bob Gullotti, Joe Hunt and Steve Langone. Drummer Bob Gullotti, leader of the Bob Gullotti Project, is a founding member of the Fringe, with George Garzone and John Lockwood. He has toured worldwide with the Fringe, Eddie Henderson, J.J. Johnson, Joe Lovano, John Patitucci and many others. He appears on over 60 recordings. He has published Modern Drummer and Downbeat . He is a clinician for Zildjian and endorses Eames Drum Co., Zildjian, and Remo Drum Heads. There will be no set list and no charts. Anything can happen. Listen to what Warne Marsh called "the spontaneous creation of beauty."